I saw this image in today’s Washington Post. The image has been haunting me. Seeing it I can’t help but put myself in this poor guy’s shoes. This man was one of the “injured” men from a suicide bomber attack near the Shaheen Hotel in Baghdad yesterday. 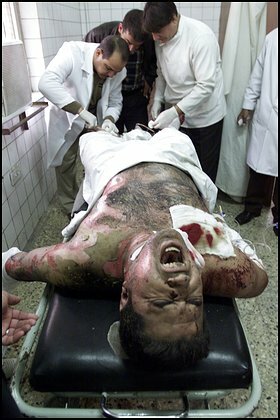 The blast killed four people, including two Iraqis, and wounded four others, including this man. He appears to have no hands or feet. It’s hard for me to think of someone like this as “wounded”. What is he lucky enough to be alive for? I am aware that if Saddam Hussein were still in power that people would still probably be tortured. Many others would be summarily executed for being the wrong ethnic type or hosts of other trivial reasons. Had we not invaded, there might have even more mass murders by Saddam’s regime. But it is clear that no war is without its ripples. It is important that once in a while we see a consequence, however unintended, or our noble intentions. This “ripple” is just another innocent man wounded in a terrorist attack in Baghdad. Just to stay alive he will need constant support. He will not be able to feed, bathe, or even go to the toilet by himself. So far over 500 of our soldiers have died. At least 5000 of our soldiers have been wounded. Conservatively 9000 Iraqis died as a direct result of our invasion. Who knows how many more will die in terrorist bombings like this that were unlikely to have even started had our invasion not opened up this Pandora’s box. There was no al Qaeda presence inside Iraq before we invaded. These and most of the other suicide bombings sure bear the mark of al Qaeda. Saddam may not be terrorizing his own people these days but others with axes to grind, principally against us, seem to be stepping in to fill his shoes. Good entry, Mark, and I share your sentiments. People are dying, and they don’t deserve to die, and it’s all pointless. What difference does it make who’s causing it to happen? It’s happening. It shouldn’t be. And there are American servicemen and women still being killed, too. Lots of families, both here and there, losing loved ones. Death is death. I can’t say we’re doing good, when people are still dying in droves. I think we should let well enough alone.